See, as Connie has become a more fully integrated member of the main ensemble, developing a skill in battle, she has also become a superhero—utilizing her now-useless glasses as part of a disguise presented to her family. This turn for the character is great for the show (“Do It For Him” is, I think, the peak of its artistic accomplishments thus far, precisely because of how well it tells this part of the story in such a short amount of time), but it’s bad for Connie—both because of the stress of dealing with her mom, and because it forces her (and the show) into the old, staid, insanely boring problem of hiding her secrets from other normal humans. It’s nice that, at the very least, this plot resolved by the end of the episode, which ignores the straightforward approach to this “secret” story in favor of riffing on first sitcom tropes (when Connie has to hide Rose’s sword from her mother) and then horror (when she has to retrieve it with Steven at the hospital). That hospital—her mom’s workplace, the site of an attack by a couple of Gem mutants—is a new setting for the show, one that I expect we’ll have to revisit in the near future for some medical tune-ups. While it doesn’t exactly suggest a spin-off, it does get the job done: introducing the fusion mutants as grunts for Peridot, and real ongoing enemies. Another place where the classics are cleverly deployed: Steven and Connie’s overly verbose language related to Rose’s sword. It taps into both the impulse to grand storytelling that Connie explores in “Open Book” and the knightly ideals Pearl has started to impart on the kids in “Sworn To The Sword.” It’s serious business, but Steven’s earnest love for Connie is why it works, and the fact that they find the whole thing just a little silly makes everything better. (See also: everything about their facial expressions while laughing at Lion chowing through plastic, which manages to be funny in its self-awareness, serious, and fun all at the same time.) 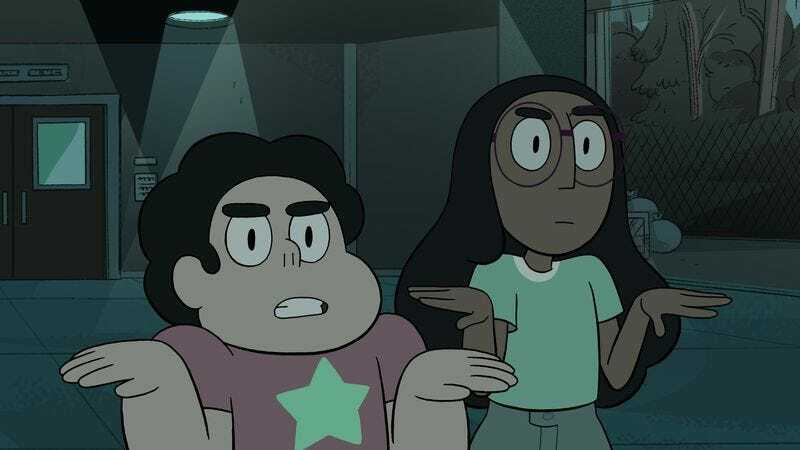 The motivation for the plot of this episode is not Steven feeling guilty over Connie being punished (where you might normally expect this to go), it’s about Connie wanted to reclaim Rose’s sword. Some things are more important than getting grounded. Still, Dr. Maheswaran’s ultimate motivation is understandable for any parent—a fear of not knowing where your child is, and a desire to keep them safe. (Remember: The Maheswarans are all about safety.) In this respect, Connie’s mom is remarkably similar to Pearl, particularly her parental single-mindedness in “Sworn To The Sword” (though, obviously, it’s turned in a very different direction). And while her actions are a little broader than you’d expect (especially when Vidalia was introduced with so much detail and complexity just a few episodes ago), the resolution of her conflict with Connie suggests some cool new directions for the people of Beach City, who will hopefully become progressively more integrated and capable of assisting with the main plot. “I hate that abacus.” Aw, poor Connie. There are just a couple of things that feel a little rougher about this episode—some of the animation is great (pretty much all of Steven and Connie’s facial expressions), but some of the movements are on the stiff side. And stuff like Dr. Maheswaran complaining about her stethoscope somehow not working should have bothered me, but it’s pretty funny. Exciting, interesting thing: It’s been almost a year since the events of “An Indirect Kiss,” when Steven’s healing abilities corrected Connie’s vision. Is that the first verbal confirmation of the show’s timeline, other than the simple background passage of time/seasons? Welcome back, everyone! I’m pretty sure we’ll be in the normal time slot for a few weeks at least, so settle in for some neeeew Steven. I know I really needed this…. did you?